Minutes later, I was suddenly at the security desk—all thanks to my Airport Angel. After a quick selfie, I made it through security and was the third to last person to board my flight to Frankfurt. Phew! SeaTac Volunteer William to the rescue! Approaching my middle seat, I realized I’d be sandwiched between a burly German and man in flowing saffron robes. The robed one’s eyes were closed, and he looked so peaceful; I hated to disturb him. When I tapped his shoulder, his eyes fluttered, he smiled benevolently, and gestured for me to take the seat next to him. Awkwardly, I climbed over the Tibetan monk and shimmied into my seat. Too shy to say anything (and not knowing what I would say to him anyways), I silently thought: This is as close to the Dalai Lama as I’ll ever be. Mid-flight, I noticed the monk repeatedly glancing at my screen. I flinched because Fargo is probably not the best airplane movie to watch when sitting next to a spiritual being, but it occurred to me that he wasn’t bothered by what I was watching. He just wanted to use his screen, too, but didn’t know how. Eventually we discovered a common language: French. After that, we learned a lot about one another. We found out where each other was born (I in California, he in Tibet) and where we now live (he in Reims, France and I in Seattle). I discovered that he had been in Seattle for two months to care for an ailing friend and that the friend had just passed away a few days ago. He learned that I love cheese, and I realized he had a sweet tooth. 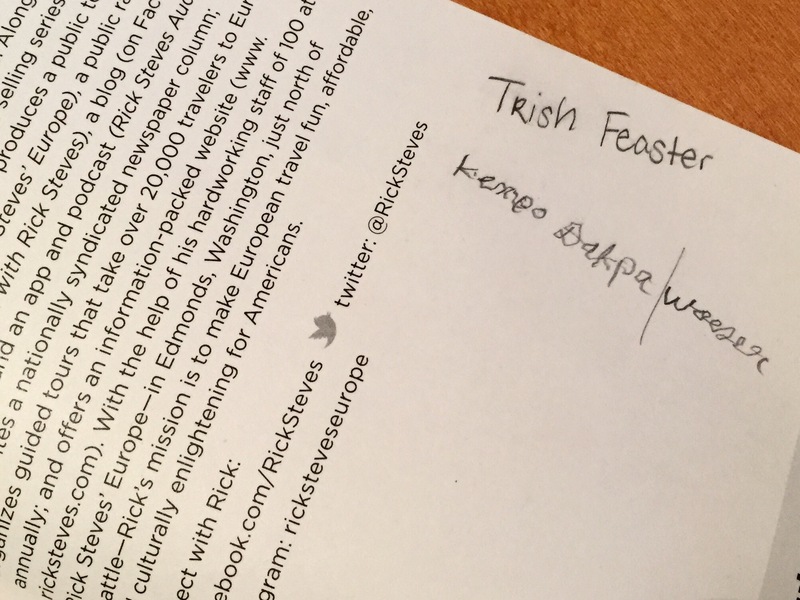 And we taught one another our names, taking turns writing them out in my Rick Steves’ Germany guidebook. One of my best souvenirs of all time: the writings of a Tibetan monk in my guidebook. After finally introducing ourselves formally, I turned to him to shake his hand and said, “Enchantée” (“Delighted to meet you” in French). He giggled, took my hand, and pressed the back of it to his cheek. I almost shed a tear. For the rest of the flight, we alternated between dozing (he’s perfectly still when he sleeps), cleaning up after one another (he took care of my trash and gave it to the flight attendants, and I wiped up his spilt sugar and spilt tea—he was charmingly clumsy). We smiled and laughed a lot together. And we tinkered quite a bit with his video screen. Eventually he settled on watching the flight path. He told me even looking at a fake blue ocean can be almost as beautiful as the real thing. When we arrived at our gate in Frankfurt, we took a selfie and then exited the plane together. He would take a 3-hour bus to Reims, and I would connect to Basel and then bus it to Freiburg. At the end of the corridor, we came to a wheelchair that had his name on it: Kenpo Dakpa Woeser (I later discovered that “Kenpo” means “Learned One”). Rather than be sad about our parting, I felt so lifted by our 9-hour encounter, and I knew in my heart that I would always remember this flight to Germany. 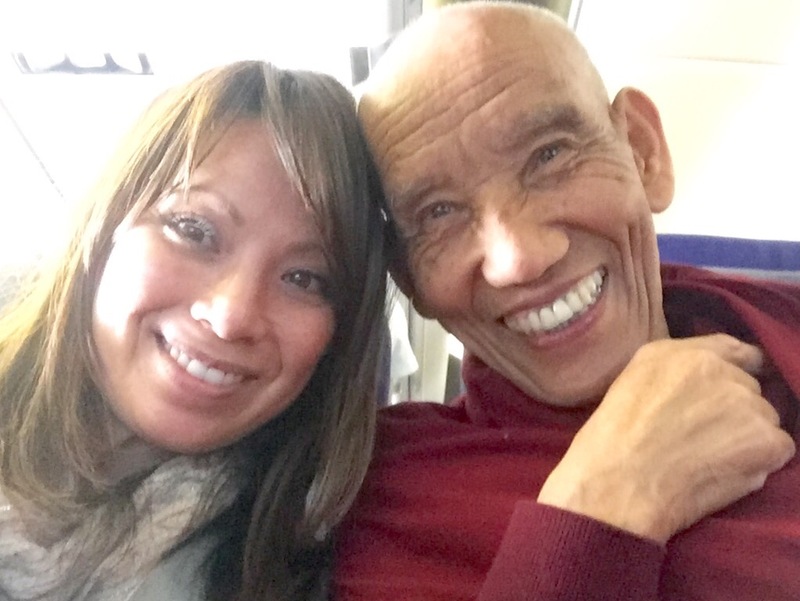 I know I’ll never see this monk again, but the impact he made on me will remain one of my fondest travel memories. I wished him a good journey to Reims. He took both of my hands into his and gently touched his forehead to mine. I don’t know the traditional significance of this Tibetan way of saying goodbye, but I do know that I felt wholly blessed to meet this gentle soul. 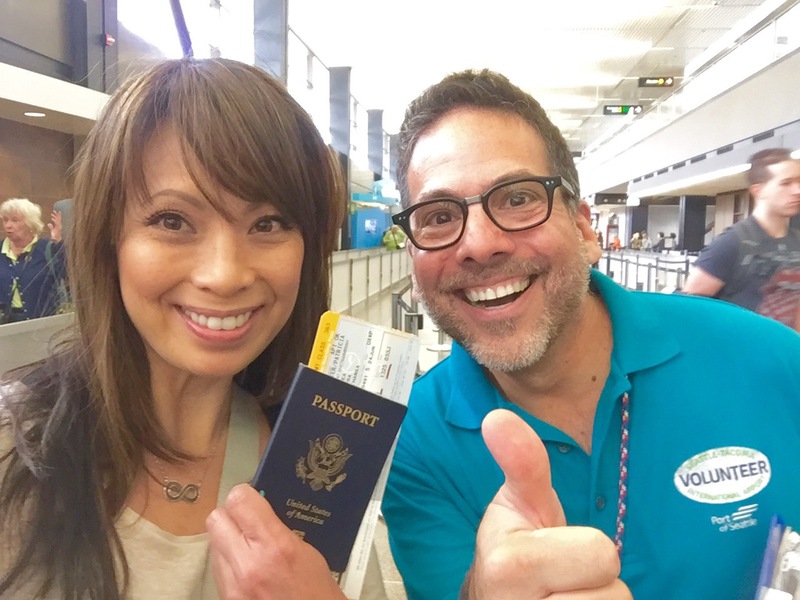 It’s funny but travel can open up a person to so many blessings in unexpected ways. Whether it’s getting help from a friend or stranger when you need it most, helping someone else who might feel more culturally lost than you, or creating a beautiful friendship (no matter how short-lived it might be), travel takes you not only beyond where you were but beyond who you were. Join me over the next couple of months as I continue blogging in Europe. Learn the ins and outs of guidebook research as I journey through Freiburg, Baden-Baden, Rothenburg, and Nürnberg to update Rick Steves’ Germany. Discover what it’s like to have Rick Steves as your Tour Manager when I join him as his assistant on the My Way Alps tour. Be my travel partner as I explore Saint-Émilion and Bordeaux for the first time during my “vacation.” And get a front-row seat on my tour bus as I lead two back-to-back Rick Steves’ Best of Europe in 14 Days tours. What an experience, you are so blessed; what a way to start your travel! Your Dad was almost moved to tears! We are looking forward to your stories as we become part of your travels! Thanks for sharing! Love and God bless! I always have you and Dad in my heart, Mom! Especially when I’m traveling. You both taught be to be open to the world around me, and I’ve grateful for how you’ve contributed to shaping me into the kind of traveler I am today. Love you! Hi Trish, Great story! Looking forward to what you see in Nuremberg and Rothenburg. Spending a few days there in August ahead of my RS tour, Berlin,Prague and Vienna. Love St. Emilion and Bourdeaux, have fun! You know, I think William might actually be some kind of travel superhero. He was our “assistant” for a few days on a recent RS Spain tour and he was awesome. And he and Amanda together were definitely a dynamic duo.